In our house, we have always been very careful about the products that we use on our skin. Since I have extremely sensitive skin, we are constantly on the lookout for products that contain no fragrance. The truth is, these types of products are quite hard to locate most of the time. Even if something says fragrance free, I have often found fragrance listed as one of the ingredients on the back of the bottle. When the boys were born, we knew it was possible that they would have sensitive skin like me. NHL was diagnosed with eczema when he was about four. My little guy had patches on his body early on. Then just a few months back, I went to the dermatologist and found out that a funny looking spot on my leg was severe eczema (looks a little different on adults). I was told to ditch my Dial soap and use items that were more moisturizing when bathing and to follow up with a moisturizer after. 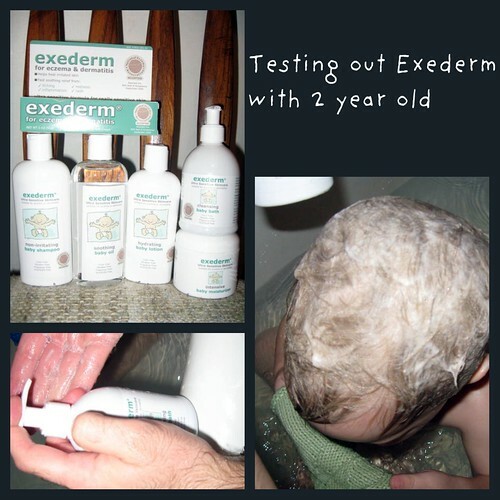 At about the same time, I was asked by Family Review Network to review some baby skin products by Exederm. This seemed like a great opportunity to try something that could help my family and our eczema. We’ve worked with a team of experts to create a range specifically designed for eczema and dermatitis sufferers. Too many personal care products contain ingredients that may irritate sensitive skin, especially for those with eczema or dermatitis – allergic reactions and rash are common. Most everyday skincare products are actually designed for the average person – even some of those products laveled as ‘Sensitive’ or ‘Mild” or ‘Hypoallergenic’. Many ‘natural’ or herbal products can be just as bad too! ECZEMA & DERMATITIS SUFFERERS ARE NOT AVERAGE – and average skincare is just NOT good enough. Exerderm offers an intelligent and common sense approach. We believe people with sensistive skin need to avoid irritants – why take risks? The National Eczema Association honored exederm with 12 ‘Seal of Acceptance’ awards in acknowledgement of our products’ ultra sensitive formulations. Exederm offers a variety of products for people with sensitive skin that may include eczema and dermatitis. By the time the products arrived, my eczema flare up was under control, but keeping it that way is critical. My 2 year old son has a few patches on his body right now thanks to the dry winter. We decided to test the products on him one night in the bath tub. First, we used the body wash. We noticed that it did not have any smell. Wahoo – truly fragrance free like it promised! Hubby was able to lather it up a little on my homemade knit cotton washcloths. Unlike some of the body washes/soaps that we have used in the past, this one did not bother JSL. He kept playing with his toys and splashing like nothing was going on. Then it was time to test out the shampoo. JSL still has cradle cap, so we need to really scrub his scalp to work at the scales. We were pleasantly surprised with the results. Hubby was quickly able to use a very small amount in his thick hair and work it around nicely. Check out how you can see it in his hair and not wonder if you have any in (photo above). The little guy is not a fan of moisturizing, so I tried those on my skin after a shower. I really liked the Intensive moisturizer. It was really thick and worked nicely on my overly dry hands. Although it was thick, it still soaked into my hands quickly and did not leave me feeling slippery. My goal is to try to use the baby lotion on JSL. He really is dry in the winter and recently I have seen some small patches of eczema cropping up on him. I also tried the hydrocortizone cream on an itchy spot and unlike others it did not burn. It quickly soothed the area and was not bothering me anymore. We will definitely be purchasing more of Exederm for our family since it works well and most importantly helps to protect our very sensitive skin. Thanks to Exederm, one lucky reader will be able select one item of their choice from the Baby Care Line. .
MAIN RULE – Head over to the Exoderm website and answer the following question: What item would you select to try if you win the giveaway? 1 Bonus Entry – Who would this product be for? Does this person has sensitive skin, eczema or dermatitis? To enter, please follow the rules above within the comment section. Contest starts today, January 31st, and ends at 10:59 EST on February 14, 2010. You do not have to be a blogger to enter, but must leave a valid e-mail address for me to contact you for mailing address once the giveaway is over. I will select the winner using random.org and contact you via e-mail. You will have 48 hours to claim the prize. If there is no response, another winner will be selected. Open to U.S. and Canadian residents only. Disclosure: I received the package baby care skin/body products complimentary of Exederm to facilitate this review as part of The Family Review Network. No other compensations was given. The opinions expressed in the review are my own feelings about the product that our family tried. I would choose the exederm flare control cream. This product would be for my daughter because she has eczema. I just subscribed to your RSS feeder. I would choose the Baby Eczema Lotion. This would be for my son. His eczema gets worse if he ever gets a cold, so I would keep this on hand for those times. .-= Whitney´s last blog ..We went out last night. =-. I would love this for both my daughters they have sever exzema. .-= Jessica P.´s last blog ..FREE Sample of Cream of Wheat =-. I would love to try the exederm intensive moisture cream on my husband’s excessively dry hands. His skin is always flaking and cracking in wintertime. I would love to try the intense moisturizer cream. I would love to try the exederm body wash for myself as I have eczema and this sounds like it would really work good. Bonus Entry~I would use this for myself as I have eczema and would love to try it! Thanks to everyone that entered this giveaway. The winner will be receiving an e-mail shortly.